These FAU fraternity members are trying to raise money for charity by standing in line at the Apple Store at Town Center Mall in Boca Raton. The latest iPhone goes on sale Friday. Left to right are Justin Koppenberger, Zachary Goldberg, Patrick Gober, and at far right is Carson Sample. 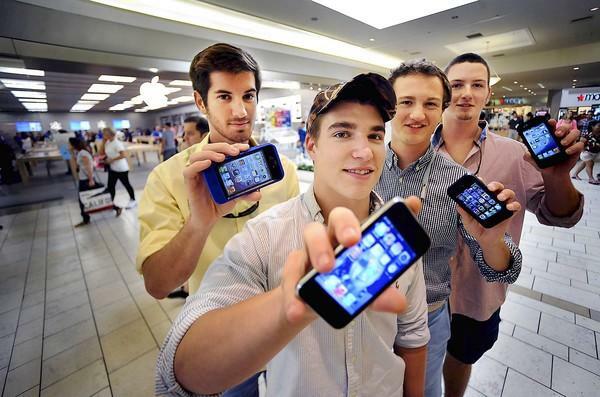 If you don't want to wait in line for a new iPhone in Boca Raton, a Florida Atlantic University fraternity is willing to make a deal with you. Members of the Delta Tau Delta fraternity will hold your spot in line at a local Apple Store in exchange for a $100 donation to their charity partner, the Juvenile Diabetes Research Foundation (JDRF). Eric Marmer, now an FAU graduate, came up with the idea last year when he was standing in line and noticed people paying other people to hold their spots. Then it clicked: Delta Tau Delta could do the same. "We thought it would be a really great gesture and just a good idea in general," said Zachary Goldberg, community outreach chairman. So last year, the fraternity decided on a last-minute plan and ended up raising $4,500. Lots of people bought spots in line and others donated just to help out. Goldberg said a local pizza restaurant heard about what the group was doing and sent them some free pizza. But this year, Goldberg said fraternity members are more prepared. He made sure more people knew what they were doing ahead of time. About 60 members are joining in this year. They'll camp out overnight in front of the store, bringing with them snacks, games and music. "It's really satisfying because at the end of it, you know, for 12 hours you waited and you did all this hard work," said Goldberg. "At the end of the day, we get to turn around and donate a big sum of money to JDRF."